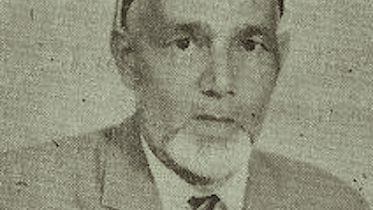 After graduating in Islamic theology Ameer Ali returned from India in 1930 as the first Trinidadian to fully qualify as a Moulvi or Islamic scholar. Described as a tall, dark and handsome man, the Moulvi was a non-sectarian Muslim.1 However, having spoken about Mirza Ghulam Ahmad at a meeting without condemning him on December 29, 1931, at the Liberty Hall, Port-of-Spain it was assumed that he was a supporter of Mirza in disguise.2 Despite his published denials he was branded as an Ahmadi. Not withstanding his controversial ideas and beliefs, Moulvi Ameer Ali ushered in a new age of enquiry. He was considered a great scholar of Islam. His knowledge of Arabic, English and Urdu gave him an advantage over his adversaries. He taught Islam in conformity with new thought and scientific discoveries. He advocated that women should work alongside men and be given equal opportunities in the social development of the community.3 This was unheard of in the traditional Muslim community. His new ideas did not meet the approval of the elders in the Muslim community. However, evidence of his leanings to Ahmadism could be discerned in his teachings. He taught that Jesus was dead and that he was not taken up to Heaven alive and therefore would not be returning to earth. He taught that the ascension of Prophet Muhammad to the Heavens or the Meeraj was spiritual and not physical. These teachings are in conformity with Ahmadi beliefs also. So despite his denials of being an Ahmadi his speech reflected Ahmadi teachings. There began to emerge antagonistic feelings against Moulvi Ameer Ali from the majority of Sunni or traditional Muslims. Already the Mufti or spiritual leader of the Tackveeyatul Islamic Association, Moulvi Ameer Ali was made Life President in June, 1935. Two of his strongest supporters were Mohammed Hakim Khan and Mohammed Rafeeq, foundation members of the Tackveeyatul Islamic Association . When differences of opinions proved to be too great between him and other members of the Tackveeyatul Islamic Association, Moulvi Ameer Ali after a lengthy court battle, withdrew along with his supporters from an organization in which they diligently worked for fifteen years. (L-R) Khwaja Khairuddin, Muhammad Ali Jinnah and M A H Ispahani. Mohammed Hakeem Khan, the first President General of the Trinidad Muslim League Incorporated did not stay to see the completion of the mosque he worked so hard to build. He resigned in 1952 before its completion. Influenced by a missionary, Moulvi Saqui, he became a Qadiani or one who believes that Mirza Ghulam Ahmad was a prophet. The foundation of the Trinidad Muslim League Incorporated was again shaken when the founding father, Moulvi Ameer Ali who gave the organization its ideology became an Ahmadi in the early 1960s on his second trip to Lahore.17 However, doubts still linger as to whether he was an Ahmadi from the very beginning but hid it under the guise of Ghair Mukallid or Non-Conformist Islam. The third founder, Mohammed Rafeeq remained loyal to the creed of Ghair Mukallidism or Non-Conformist Islam. This was extremely important to the survival of the League and the members who firmly believed in the founding ideology of Non-Conformist Islam. Not all the members of the Trinidad Muslim League Incorporated were Ahmadis. From sixteen branches and groups affiliated with the Trinidad Muslim League Incorporated under the banner of Ghair Mukallidism or Non-Conformist Islam in the late 1950’s, the League now had only the St. Joseph Jamaat or branch loyal to the founding ideology of its organization. Those who remained true to the ideology of the League proved that they were worthy of their firm beliefs. Mohammed Rafeeq however, passed away on the 22nd of April, 1962. In 1967, the Trinidad Muslim League Incorporated made a decision to become an affiliate of the Ahmadiyya Anjuman Isha’at Islam of Lahore, Pakistan and also a member of the Ahmadiyya Anjuman of the Western Hemisphere.21 This was done at a Conference presided over by then Attorney General of Trinidad and Tobago, Justice Noor Hassanali. All jamaats or branches of the Trinidad Muslim League Incorporated except one advocated affiliation.22 During this period injunctions and solicitors’ letters were exchanged between the ruling majority of the Ahmadis and those loyal to Ghair Mukallid or Non-Conformist Islam. Bazaars of the Trinidad Muslim League Incorporated were held on the same day but at different venues by the opposing factions. In light of the fact that mostly Ahmadis were in control of the League at this time and the majority of members felt that Ahmadiyya was compatible with Ghair Mukallid or Non-Conformist Islam, a decision was made to affiliate the League to the Ahmadiyyat Movement. The name Trinidad Muslim League Incorporated was changed to The Trinidad Muslim League Inc. Ahmadiyya Anjuman Isha’at Islam.23 This was a low point in the history of the Trinidad Muslim League for those who stood loyal to Ghair Mukallid or Non-Conformist Islam. Soon after the building of the TML Headquarters which now holds the Rafeeq Memorial Secondary School, a school library, The TML Office, counselling room and kitchen facilities was spear-headed by Nazeer Mohammed, a stalwart of the League. The land east of the Headquarters was leased to the Trinidad Muslim League with the help of Kamaluddin “Charch” Mohammed.25 The “tent” which now houses the TML Kindergarten and the Café was also supervised by Nazeer Mohammed. In fact, when he returned from performing the Hajj or pilgrimage in Makka, Saudi Arabia he invited a few people to the mosque one evening for the Maghrib prayer after sunset and he unfolded the tent design by means of solving a mystery. The TML Archives was formally opened on Tuesday November 17th 1992 on the 45th Anniversary of the Trinidad Muslim League Inc. This date also coincided with the 88th birth anniversary of Mohammed Rafeeq.26 Thus from then till now the Trinidad Muslim League had been functioning under the umbrella of its ideology of Ghair Mukallid or Non-Conformist Islam. 1 Interview with Salima Muradali, Sunday 20th February, 2005, Farah’s Court, South Valsayn. 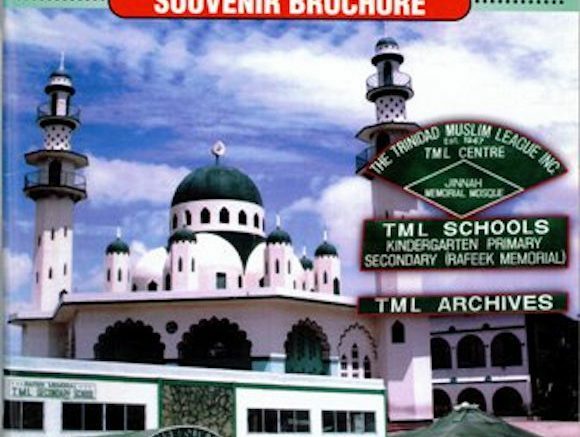 2 Mohammed Rafeeq, “History of Islam and Muslims in Trinidad” in the Souvenir Brochure of the Jinnah Memorial Mosque. Trinidad Muslim League Inc., League Centre, St. Joseph, Trinidad, B.W.I., 1954, Page 31. 4 Silver Jubilee Brochure, Trinidad Muslim League Inc. Ahmadiyya Anjuman Isha’at Islam, Eastern Main Road, St. Joseph, Trinidad. 5 Interview with Rabeune Mohammed, Sunday 27th February, 2005, at the home of the late M.A. Hafeez, 26, Woodlands Avenue, North Valsayn. 6 Mohammed Ibrahim, “Foreword” in the Trinidad Muslim League Inc. Ahmadiyya Anjuman Isha’at Islam, Silver Jubilee, Page 5. 7 “A Historical Review of the TML” in the 50th Anniversary Souvenir Brochure, Eastern Main Road, St. Joseph, Trinidad, 1997, Page 21. 9 Interview with Rabeune Mohammed. 10 Interview with Salima Muradali. 11 Trinidad Guardian Thurs. Nov.4th 1948, Page 5. 12 Trinidad Guardian Saturday Nov. 6th 1948, Page 7. 13 Trinidad Guardian Thursday Nov 11th 1948 (Trinidad News) Page 5. 14 Trinidad Souvenir Brochure of the Jinnah Memorial Mosque Muslim League Inc., League Centre, St. Joseph, Trinidad, B.W.I., 1954, Page 1. 15 “ A Historical Review of the TML” in the 50th Anniversary Souvenir Brochure, Eastern Main Road, St. Joseph, Trinidad & Tobago, 1997, Page 21. 16 “Opening Day Celebration April 25th, 1954.” in the Souvenir Brochure of the Jinnah Memorial Mosque, Trinidad Muslim League Inc., League Centre, St. Joseph, Trinidad, B.W.I., 1954, Page 48. 17 Mazac A. Shaama, “The Twenty-Fifty Anniversary of the Trinidad Muslim League Inc. Ahmadiyya Anjuman Isha’at-i-Islam” in the Trinidad Muslim League Inc. Silver Jubilee Brochure, St. Joseph, 1972, Page 30 . 18 M.A.Aziz, “Ahmadiyya Anjuman of Trinidad & Tobago” in the Third Ahmadiyya Convention 1970 Brochure, Page 43. M.A. Aziz was the 3rd Vice President of the Ahmadiyya Anjuman Isha’at Islam for the Western Hemisphere from 1969-1970. He was also the President General of the Trinidad Muslim League Inc. Ahmadiyya Anjuman Isha’at-i-Islam from 1970-1976. 20 Nazeer Mohammed, “Struggling For A Visible Identity” in the 50th Anniversary Souvenir Brochure of the Trinidad Muslim League Inc., League Centre, St. Joseph, 1997, Page 26. 21 Mohammed Ibrahim, “Foreword” of the Silver Jubilee Brochure of the Trinidad Muslim League Inc., Ahmadiyya Anjuman Isha’at Islam, St. Joseph, 1972, Page 5. 22 Mazac Shaama, “The Twenty-Fifth Anniversary of the Trinidad Muslim League Inc., Ahmadiyya Anjuman Isha’at-i-Islam” in the Silver Jubilee Brochure, St. Joseph, 1972, Page 33. 23 Nazeer Mohammed, “Struggling For A Visible Identity” in the 50th Anniversary Souvenir Brochure of the Trinidad Muslim League Inc., St. Joseph, 1997, Page 26. 26 “The Story of the TML Archives” in the 50th Anniversary Souvenir Brochure of the Trinidad Muslim League Inc., St. Joseph, 1997, Page 43. Be the first to comment on "The TML’s Founding Fathers"